Two lakes beneath the ice sheets of Greenland have disappeared, developments that scientists fear could signal worrisome changes to a region extremely sensitive to climate change. The first lake, which previously held nearly 7 billion gallons of water from melting ice caps, left behind a crater 2 kilometers (1.2 miles) across and around 70 meters (230 feet) deep. Ohio State's Ian Howat, who led the team that discovered the cratered lake described in the journal The Cryosphere, said this would suggest that meltwater has started overflowing the ice sheet's natural plumbing system and is causing "blowouts" that simply drain lakes away. "The fact that our lake appears to have been stable for at least several decades, and then drained in a matter of weeks -- or less -- after a few very hot summers, may signal a fundamental change happening in the ice sheet," Howat said. In a related discovery described in Nature, a team led by Michael Willis of Cornell discovered a two-mile-wide lake that has drained twice since 2012 -- at one point experiencing a sub-surface blowout that drove nearly 57,000 gallons of water (about the volume of a large backyard swimming pool) out of the lake every second. And for the first time, the researchers saw that the melt water was actually refilling the lake, which poses problems. "We're seeing surface meltwater make its way to the base of the ice where it can get trapped and stored at the boundary between the bedrock beneath the ice sheet and the ice itself," Willis said. "As the lake beneath the ice fills with surface meltwater, the heat released by this trapped meltwater can soften surrounding ice, which may eventually cause an increase in ice flow." This is the latest dose of troubling news for the Greenland ice sheet, which has lost more than 10 billion tons of ice per year since 2003. Once thought immune to global warming's effects, melting in northeast Greenland could significantly boost Greenland's contribution rising seas around the globe. A Nature Climate Change study last year found that northeast Greenland's Zachariae glacier retreated 12.4 miles in the last decade. For comparison, southwest Greenland's Jakobshavn glacier -- the fastest flowing glacier on Earth -- has retreated 21.7 miles in the past 150 years. There is a growing body of evidence that melting has intensified due to climate change and is causing unheard of changes in the country, which is about 80 percent ice. Among the changes are increasing numbers of surface lakes, which are much farther inland and at higher altitudes than in the past. Willis and his team first became interested in the lakes while mapping ice changes around the edge of the Greenland ice sheet. They wanted to better understand how much of the accelerating ice loss in Greenland is caused by melting and how much is caused by the increase of ice moving into the ocean. As he conducted his research, Willis spotted a 70-meter-deep hole -- the equivalent of a 10-story building -- that had formed when a sub glacial lake, far beneath the ice surface, emptied in the late fall of 2011. Between 2012 and 2014, Willis and his fellow researchers watched as summer meltwater on the surface of the ice made its way down cracks around the hole and refilled the empty lake basin at the base of the ice cap. 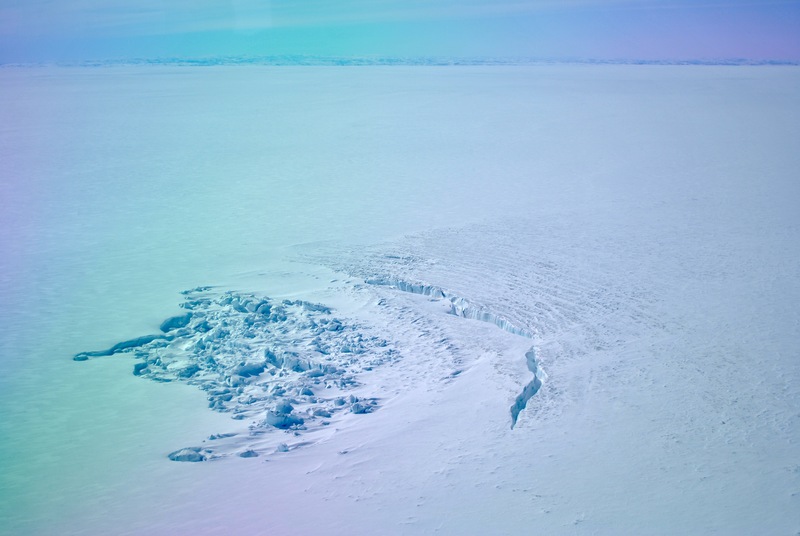 "We can actually see the meltwater pour down into these holes and then watch these subglacial lakes drain out and fill up again in real time," said Ohio State's Michael Bevis, a co-author on the Nature study. "With melting like that, even the deep interior of the ice sheet is going to change," he said. "If enough water is pouring down into the Greenland ice sheet for us to see the same sub glacial lake empty and refill itself over and over, then there must be so much latent heat being released under the ice that we'd have to expect it to change the large-scale behavior of the ice sheet." The lake discoveries have raised the possibility that there are many more lakes under Greenland. Since they are so hard to detect by radar and because the region has been explored much less than Antarctica, Howat and others said the next step is trying to learn more about Greenland's topography. "Until we get a good map of the bed topography where this lake was, we have no idea whatsoever how many lakes could be out there," Howat said. "There may be something really weird in the bed in this particular spot that caused water to accumulate. But, if all you need is a bumpy surface a bit inland from the coast, then there could be thousands of little lakes."